Swimmers will soon be able to use NFC wristbands to set up personal training regimes and measure their performance in the pool. A pilot in five pools in Israel will use the wristbands, a mobile app and light runners along the bottom of swimming lanes connected to LCD displays on the pool wall. Swimmers will download the app and get an NFC wristband from a participating leisure centre. They will then need to enter their swimming regime into the app, including the number of lengths they want to complete and the time they hope to do it in. 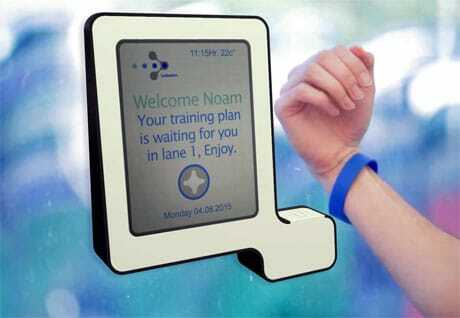 Once in the pool, the swimmer taps their wristband against a poolside kiosk which will direct them to a lane. Once in the water, the light runners will act as pacemakers. The pilot is designed by startup Ledswim and NFC Israel, whose CEO Oren Cohen spoke to NFC World in advance of its launch in May. “The NFC wristbands feature a regular NFC tag, the NTAG203 chip, so that the app can just read the UID from it,” he said. “We use the NFC UID in order to connect the swimmer to the application. “So, once the swimmer gets their wristband from the country club or the fitness club, before entering the pool, they identify themselves with a tap of their wristband against the NFC-enabled pool kiosk, which is a Sony Xperia Z tablet. “This gives the swimmer their lane number. Once they enter the pool, they then tap their wristband against a reader at the beginning of their lane before starting their swim. The light runners along the bottom of the swimming pool lane act as the pacer, so this measures the pace and progress of the swimmer which then gets displayed on the LCD display at the end of the swimming pool lane.